CM G740M - thanks for the link again, but it's not relevant in this case. As for the rpm, I am already running at high constant or max rpm to try to get it working properly. Edit. And now there's a strange rhythmical throbbing coming from the system. It sounds like it's groaning every few seconds. In fact looking at the fan speeds I can see it happening - look at CPU Opt, the purple line. That should be rock solid like the system fans. Instead the pump is speeding up and slowing all the time. Did you sort your problem. I have recently installed a Nepton 240M after running with a Corsair H50 for 5 years. Both I had my pump running from the CPU fan connector and the Fans from a normal pwm connector. Advice I have heard is to run both from the power supply so you get full speed. but I have always ran from the motherboard. My pump is running at about 2800rpm and my fans at 1400rpm (fans only at 50 percent). I have the pump running fixed at full speed from the cpu opt header, with the fans running from the cpu fan header pwm controlled. The pump sits around 2800 but sometimes just stops, or doesn't start up with the computer. Also it sometimes sounds like an old central heating system, with rushes of liquid starting and stopping. Or it's just plain LOUD. I have heat and fan speed warnings set and they're just going off too often when the pump just stops, Tbh I am going to buy another cooler and bin this when I have enough time to fit it. It's not working correctly and I can't be without the computer for the time it takes for a return. Sounds like there is an issue with the Cooler/pump. If its under warranty still which it should be as the nepton 240m is quite new you should log a call with cooler master - If you have to return it just install the OEM cooler that came with your CPU. There's one last thing you can try - Bypass the mobo connectors and use a converter cable to a molex and run it direct from the PSU. It is runs fine from that then you know its something to do with your mobo. I also experience EXACT same problem, also on X99 Gigabyte Mobo (X99M-Gaming 5). Wen connected to CPU_OPT Pump would start and stop, or stop after 30min or don't start at all. Sometimes Shutdown helps sometimes it doesn't. I re-plugged it as SystemFan1 and set 100% Full Speed in BIOS for it. It's been working Much better but also stopped once yesterday. I've ordered Molex to Fan adapter to try that next. I can't believe it's a faulty Mobo since I am clearly not the only one having this issue. I emailed Gigabyte Support only thing I got so far is Clear CMOS (not very helpful). 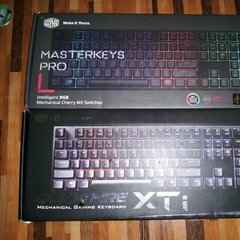 No reply from CoolerMaster as yet. Let me know if you ended up sending it back - might save me some hassle! Thank god I found your posts, OP. I have been trying everything. Even re-applying thermal paste to my waterblock! (Royal PTA). So to summarize: I fixed my running hotter than 'ell Nepton 240M by inverting the plug-in points for pump and fans, and have my fans running at 100% in BIOS. I have the exact same problem with my Nepton 240m. Almost fried my CPU because the pump didn't start. I also have that clicking sound from the pump. It would be very rare for a CPU to fry if the cooler stops functioning. The CPU would hit the thermal limit and shut down before damage occurs. If your pump is not working properly please try connecting the pump cable to a different header such as a 3 pin System Fan or Chassis Fan header. You can also submit an RMA thought the link below if the cooler is defective.